Denton and Reddish MP, Andrew Gwynne has backed Labour plans for a radical shake up of the UK banking system to provide the long-term funding needed to prepare our economy for the future, support communities neglected by the finance system, and kick start Labour’s Green Industrial Revolution. Labour’s publicly owned Post Bank run through the post office network will ensure every community has easy access to face-to-face, trusted and affordable banking.Labour’s Post Bank would have by far the largest branch network of all UK banks. The Party estimates it could create up to 3,600 Post Bank branches, helping to revitalise High Streets by bringing foot fall back into our town centres. 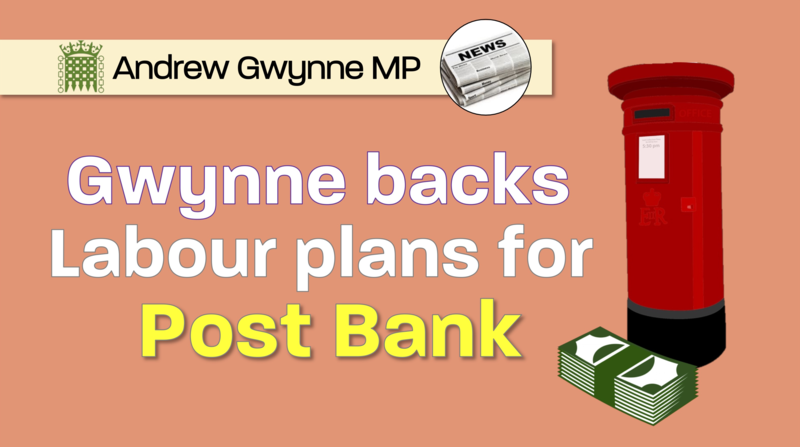 A network of Post Bank branches would help stem the tide of post office closures, uniting important banking, business and community services under one roof and creating skilled jobs within one of the country’s most trusted brands. Research by Which? has revealed that the UK has lost nearly two-thirds of its bank and building society branches over the past 30 years, from 20,583 in 1988 to just 7,586 today, leaving a fifth of the population two miles away from their nearest branch. Over the past five years the Post Office has announced the closure of around 150 Crown Post Offices, 40% of its 2013 Crown Post Office network.As well as offering banking services to individuals, the Post Bank will provide relationship banking with small businesses, acting as an “on-lender” for the regional development banks, to kickstart SME investment. keeping RBS in public ownership when it returns to profitability, a decade after it was bailed out by taxpayers. Too many high streets have become blighted by short-sighted bank branch closures. Small businesses can’t get the loans they need and vulnerable and elderly constituents lose out when banks put their profits ahead of customer need and close their branches. “Finance is the central nervous system of the economy. It directs investment, deciding which businesses and projects get off the ground and which fail. For too long, this vital part of our economy has been solely in the hands of the big banks and the speculators. As the financial crisis, scandal after scandal and the chronic lack of investment for our SMEs, manufacturing and in our infrastructure show, this model has failed. “When the financial crisis struck, the banks were bailed out but the rest of us were sold out. It’s time to secure the investment that we all made and use it to benefit the many not the few. “Poor access to local bank branches hurts our town centres and local communities, particularly affecting elderly and more vulnerable customers, as well as damaging the ability of local small businesses to invest.